In 1740, Nathan Levy—one of the first Jewish residents of Philadelphia—requested a plot of land to give his child a Jewish burial. This plot on Spruce Street became the first Jewish communal cemetery and marked the beginning of organized Jewish life in the colonial city. Throughout the nineteenth and early twentieth centuries, floods of Jewish immigrants came to the United States from Europe and settled in Philadelphia and throughout the Delaware Valley. As a result, hundreds of synagogues were organized and flourished. 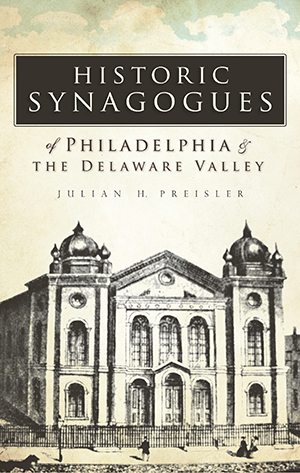 Today, Philadelphia's myriad synagogues are like living museums of architectural history. From small wooden structures that evoke Eastern Europe to the sharp angles, modern lines and soaring sanctuary space envisioned by Frank Lloyd Wright, these synagogues reflect changing trends in style, design and function. With this comprehensive collection of images, Preisler helps record the region's unique religious and cultural history and captures in time its architectural treasures. Julian Preisler is a researcher, genealogist, and author residing in the Eastern Panhandle of West Virginia. A graduate of the University of Florida and Mary Washington College, he has a broad background in archives and history and has been a professional genealogist and researcher for over 18 years. The son of Holocaust Survivors from Germany and the Czech Republic, Preisler is a native of Detroit, Michigan and has had an interest in Jewish history/genealogy and synagogue architecture for over 25 years. He has published several books and has written articles for a variety of Jewish and non-Jewish newspapers. Preisler has also been in involved in photographing and indexing U.S. Jewish cemeteries for many years.